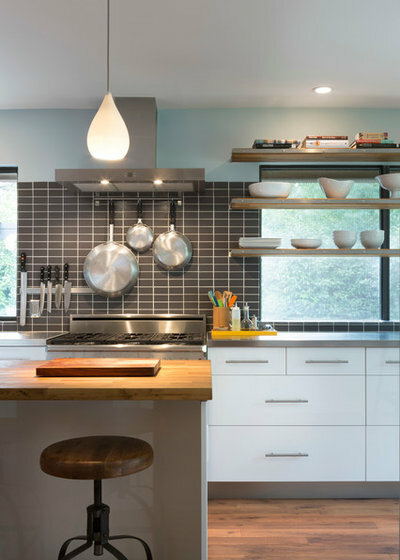 For kitchen remodels a lot of focus goes into what’s seen on the surface, and rightly so. 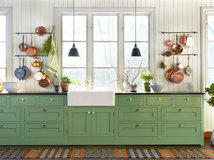 Cabinets, appliances, countertops, paint colors — these are the big players that make your kitchen look the way it does. 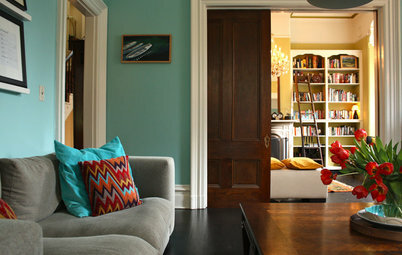 But oftentimes it’s the more subtle gestures that will make your space truly functional and efficient. 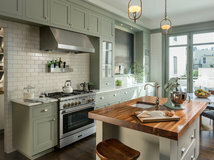 With that in mind, here are 13 kitchen solutions to consider for your remodel or new construction — and how much they might set you back. 1. Pullout platter storage. Entertaining often means getting out the stepladder to grab an oversize platter from the upper reaches of a cabinet or wall. Edo Rosenberg of Kitchens by Meyer came up with this solution, which integrates a pullout compartment in the end of a kitchen island. It commands a lot of space — it’s 30 inches wide and 24 inches deep — but houses large platters at arm’s reach in a divided, safe enclosure. Cost: Rosenberg says this custom feature cost his client roughly $1,200. 2. Countertop appliance garage. If you have enough countertop space, tucking away regularly used small appliances, such as a toaster or blender, in a dedicated space behind closed doors will allow you to keep your counter free of clutter and cords. 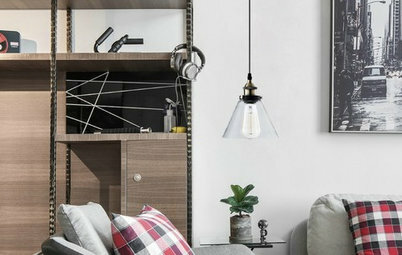 Kayron Brewer of Studio K B designed this nifty niche to include an outlet and LED lights so all the small appliances can be used right where they are. Cost: Brewer estimates that this appliance garage ran $1,600 to $1,900, including the cabinetry, LED lighting strip, power and labor. However, she points out that the appliance garage was part of a full cabinet and construction package, so it’s tricky to price it separately. 3. 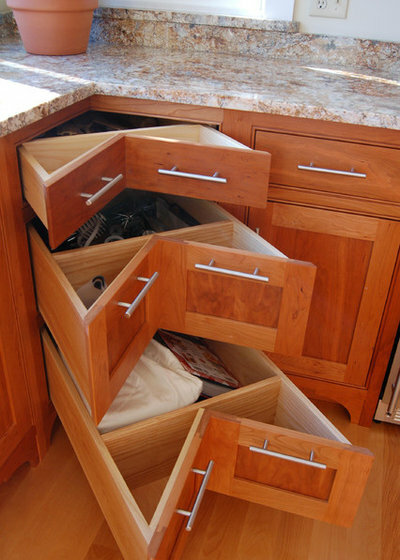 Corner drawers. Move over, Lazy Susan. You’re not the only clever solution for corners anymore. Full-depth corner drawers are helping homeowners get the most out of tricky spaces. Cost: Commonly $125 to $225 per drawer (hardware only). 4. Shallow rollout. 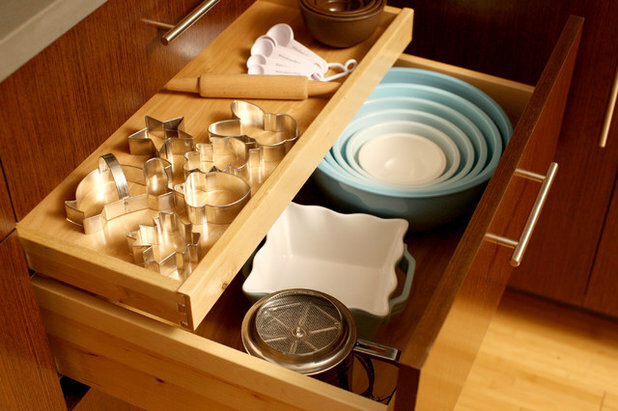 Never let a deep drawer swallow up your holiday cookie cutters or cupcake papers again. This slim rollout hovers above another drawer, sharing the same drawer face and hardware. 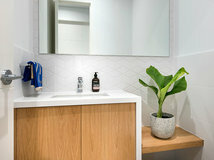 Cost: Jodi Tramontin of Dura Supreme Cabinetry shares that the cost of a rollout like this is $200 to $275; the feature must be added at the time you order new cabinets, as the company doesn’t offer it as a stand-alone item. 5. Rollout drawer for cleaning supplies. How often have you knocked over three bottles of cleaning products stockpiled beneath your kitchen sink to reach the one you wanted in the back? 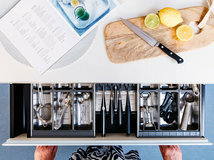 Instead, consider storing them in an easy-to-access steel rollout drawer with optional flexible magnetic organizer compartments for keeping them upright. 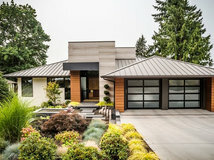 This stainless steel system by Dura Supreme has concealed undermount glides and is self-closing. 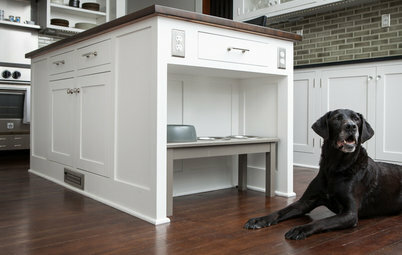 Tramontin says it can be added to any of the company’s cabinets that are 12 to 48 inches wide. Rollouts between 39 and 48 inches wide have a center stile for support. Cost: $400 to $1,000 for a new cabinet with one factory-installed 12- to 36-inch wide rollout; $525 to $1,300 for a new cabinet with two rollouts. 6. Pullout spice rack. Spice containers are usually a messy lot, getting knocked over in pantries and stuffed into wall-mounted racks that don’t easily accommodate different bottle sizes. 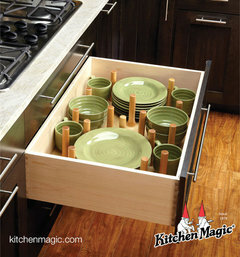 Organizing them in a pullout spice rack that fits into your cabinetry will keep them in check. Pullout spice racks are usually 3 to 12 inches wide and can be installed in base cabinets or upper cabinets. 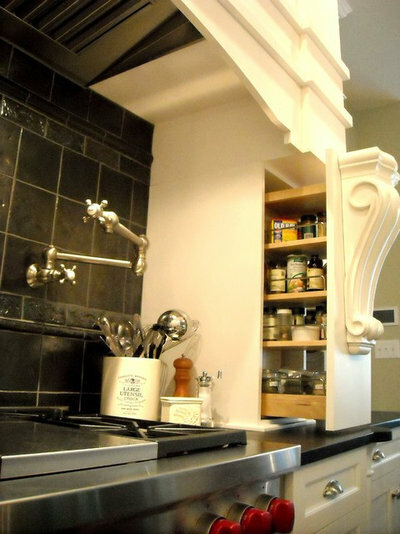 Many homeowners opt for two pullout spice racks to flank a cooktop or install them on opposite sides of a hood for symmetry. Cost: About $200, but varies depending on the manufacturer, material finish and size. 7. 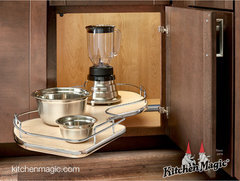 End cabinet or island cookbook storage. 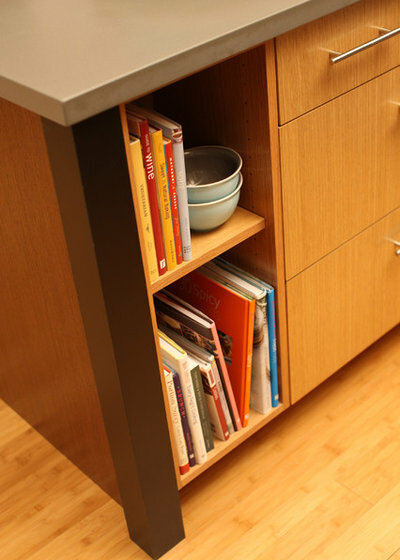 The exposed end of a lower cabinet is a great place for sneaking in some cookbook shelf space, as in this example. Cookbook cabinets are typically 15 to 36 inches wide, Tramontin says. She adds that almost any cabinet can be used for cookbook storage if you omit or remove the cabinet door and finish the interior. Cost: About $300 to $600 for a 36-inch-high wall bookcase cabinet; $600 to $1,200 for a base bookcase cabinet. 8. 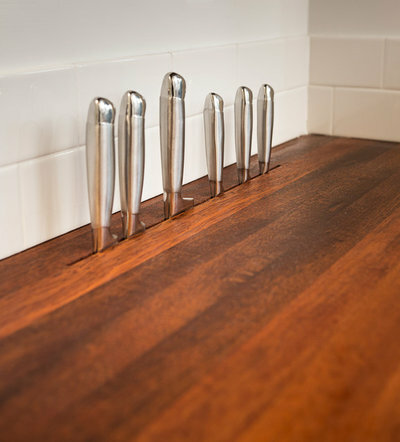 In-counter knife storage. If you don’t like the look of a freestanding knife block but want to keep knives close at hand, consider an in-counter knife slot. Austin, Texas, woodworker Daniel Vos of DeVos Custom Woodworking says he custom makes these slots in new wood countertops that he also fabricates. A drop-in knife block is another option. It offers enclosed storage for knives within the confines of the knife block, which is inset into a kitchen counter or island. An existing piece can be retrofitted to include one, or one can be included in a new project, Vos says. A custom knife block can be made out of any wood, either contrasting or matching the countertop. Slots for the knives are customized to the client’s specifications. (Vos says clients sometimes just send him their knives.) Vos then insets the custom-made block into a slightly smaller hole cut in the countertop, leaving the block overhang resting on the countertop for support. It’s raised ¼ to ¾ inch above the countertop level. The knife block configuration is also removable for cleaning. Cost: A knife block and associated labor should run around $350. The cost for a knife slot like the one shown here is a $200 upcharge to the cost of a countertop. 9. Walk-in pantry. A kitchen with a walk-in pantry gets high marks on most folks’ dream lists. You just need to have the room. 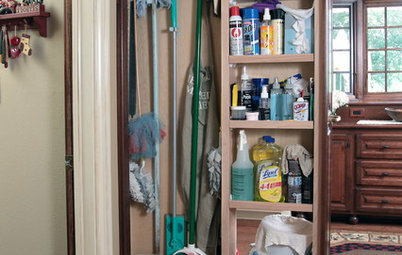 In lieu of a true walk-in, some kitchens have a closet that’s often poorly designed with scores of fixed shelves that don’t fit larger items, while space is wasted by disorganized smaller items. 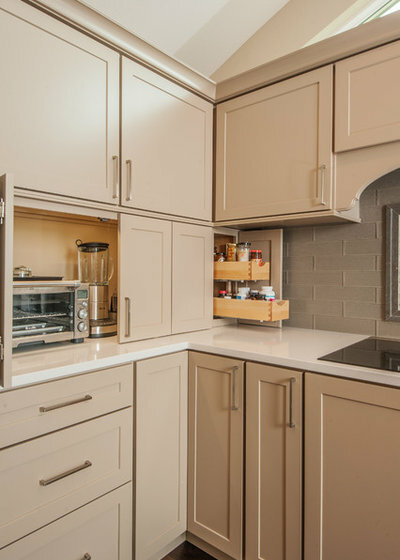 A professional closet designer or kitchen designer can help optimize your storage capacity and flexibility if you’re redoing or adding a pantry during a kitchen remodel. 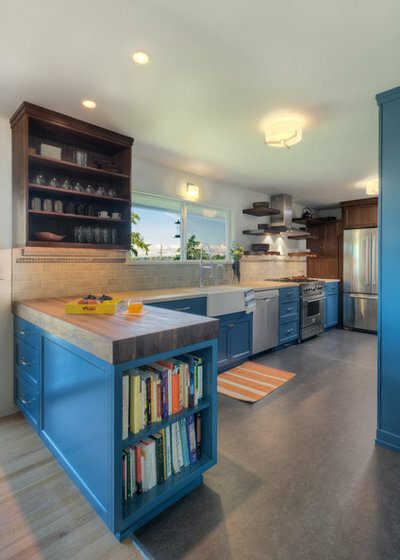 The stunning pantry in this longtime popular photo on Houzz features a bevy of built-ins and pullout baskets, overhead lighting and an electrical outlet for small appliances. Generously sized at about 40 inches deep and 108 inches wide, the pantry can be closed off from the kitchen with the aid of two pocket doors. 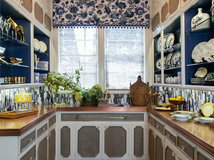 Cost: Designer Marie Newton of Closets Redefined says the cost of this large pantry project totaled about $5,500. 10. Pantry system. 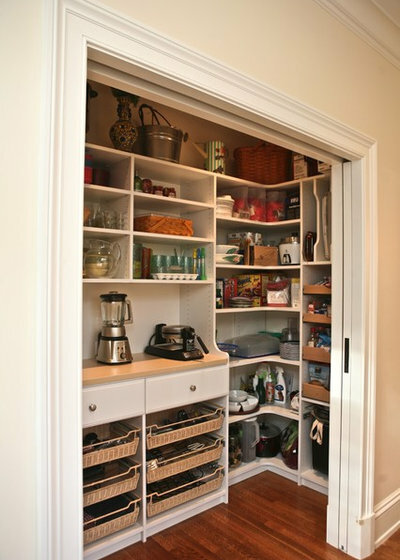 If your kitchen can’t accommodate a walk-in pantry, consider a pantry system. 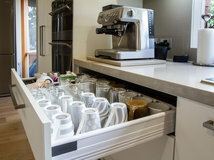 Unfolding like origami, a pantry system offers unparalleled organization within a cabinet, so you’ll be able to find what you’re looking for quickly and easily. Many systems are available, with different configurations, heights and shelving options. What I like about this one is that it’s rather simple and doesn’t have a lot of swinging components. 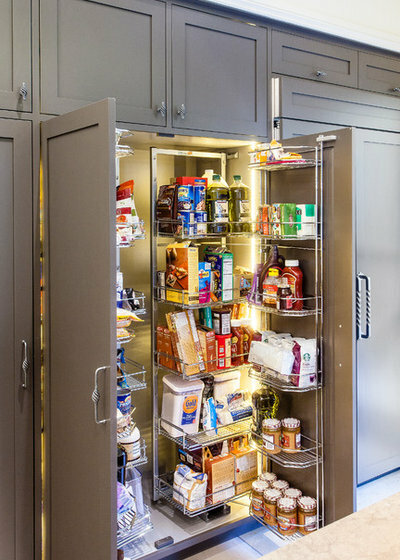 Because its interior is oriented vertically and not horizontally, as in a traditional pantry, the visual barriers are eliminated and it’s easy to see items from top to bottom. Cost: Varies, as different manufacturers offer an array configurations and sizes. Designed by Jensen Design for Tommy Hein Architects, the system (by Häfele) seen here cost about $2,500 installed. 11. Library ladder. While a kitchen with lots of storage is usually seen as a good thing, often the storage is above our heads and out of reach. A kitchen library ladder may be your stairway to organizational bliss. 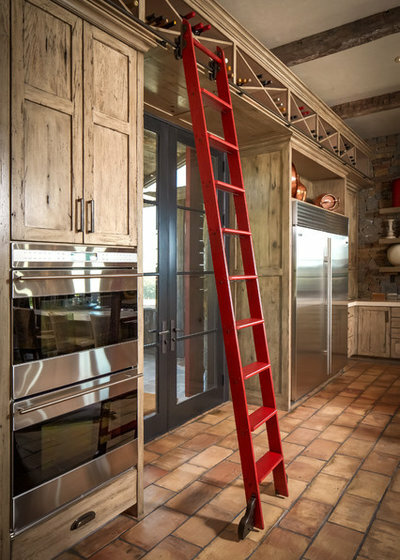 Made of wood or metal, traditional or contemporary, a library ladder can blend with almost any kitchen style. Ladders are either a removable hook type or a permanently attached rolling style. Many styles can even be pushed against the wall when not in use so they don’t become a tripping hazard. 12. Backsplash storage. 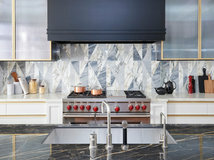 While many folks see a backsplash as an aesthetic part of their kitchen design, it can also be useful for easy-access storage of utensils, knives, cookware and dishes. 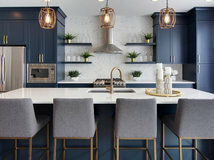 Hanging bars, magnetic strips, shelving and even pot-filling faucets can help make the most of your kitchen backsplash. Cost: About $60 per hour for labor plus the cost of materials and systems. 13. Wall-mounted pegboard. 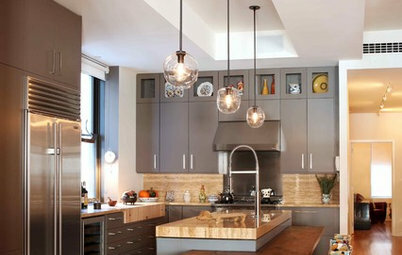 Many homeowners have small kitchens with limited cabinet space. An unused wall, or even a portion of it, can be transformed into an efficient storage space. 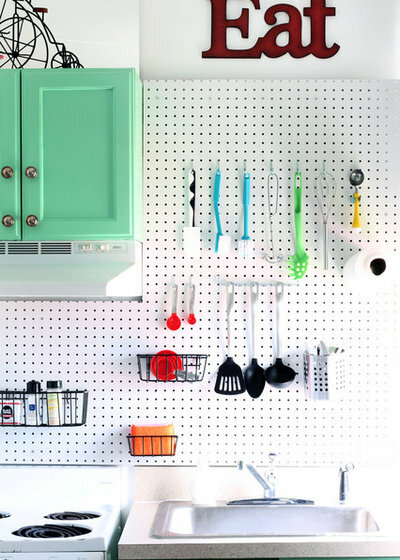 Wall-mounted pegboard protrudes minimally and is less likely to interfere with cabinet or refrigerator door swings. Pegboard is also a great addition to a pantry space. You can cover as much or as little of the wall in pegboard as you desire — you can even customize the shape of the pegboard. It’s endlessly flexible, because you can add, subtract or move the hooks around as you please to hang pots and pans or small kitchen utensils. Cost: A 4-foot by 4-foot finished and installed pegboard (without hooks) should run about $75 at most. Plan to spend $10 to $40 per sheet of pegboard, depending on the thickness and size. 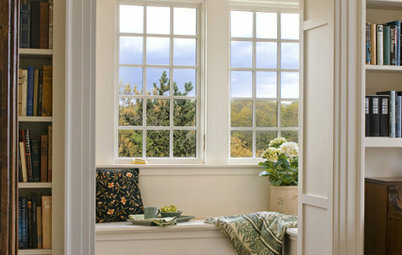 We are always happy to make recommendations to homeowners that help them make the most of their existing space. It's up them how much they are willing to spend on their kitchens though. It's not about up-charging. We just want to help them make their new kitchens beautiful 'and' functional. 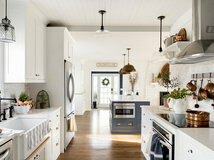 The masses are looking to transform their kitchen to some shade of white or gray. 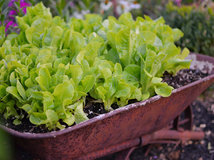 And why not, that's what their showing in magazines and here on Houzz. It will also be brighter and feel more open. Having less on the counters would help with that too. 1) Which leads us to storage. "Hands down", the most asked for storage item is the trash bin roll outs. Why on earth were we all spending upwards of $100 on a stainless garbage cans and displaying them proudly on the side of the cabinet or fridge? It's a garbage can! 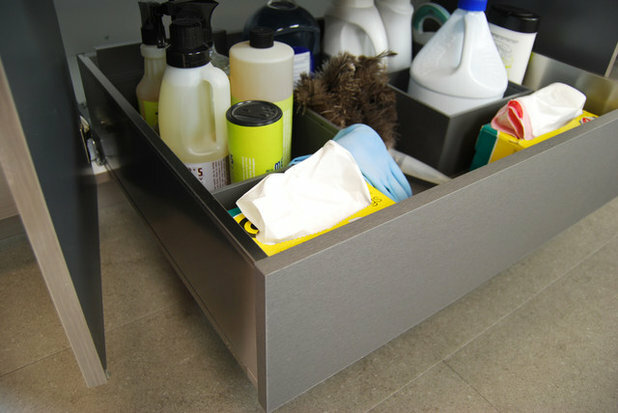 Now, make a small adjustment to one cabinet and your trash is concealed and you don't have to step on a pedal to open it. Roll it out, toss and roll it back in. Not to mention you just gained about about 144" sq'. inches of floor space. 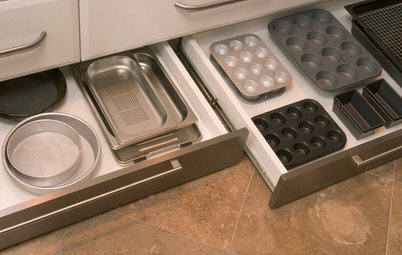 2) Next on the 'I want' list, pot drawers, love em', gotta have 'em! and for a small investment, think how much quieter it will be when you start cooking dinner every night. 3) Cutlery inserts. That plastic tray from the dollar store, are 'out', built in dividers 1 and 2 tier are a small investment for another organization necessity before the silverware drawer gets out-of-control...again! 4) Spice rack roll outs. Adjacent to the side of the stove, 2-3 shelves that are the width of a spice jar. Yes, homeowners want this and are asking for it to make cooking that much more simple. For a small 6"-8" sacrifice from another cabinet, any spice is at your finger tips. 5) And last but never least, the blind corner lazy susan. We just 'rolled it out' (sorry we had to say it) 'The Cloud'. It swivels so you don't have to squat down and crawl in anymore. 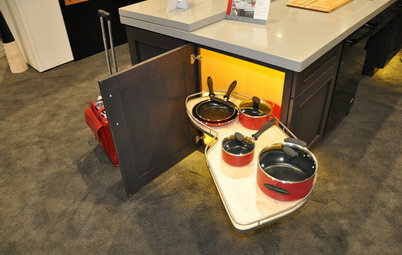 An innovative twist on an old storage concept-the'ol school' lazy susan. 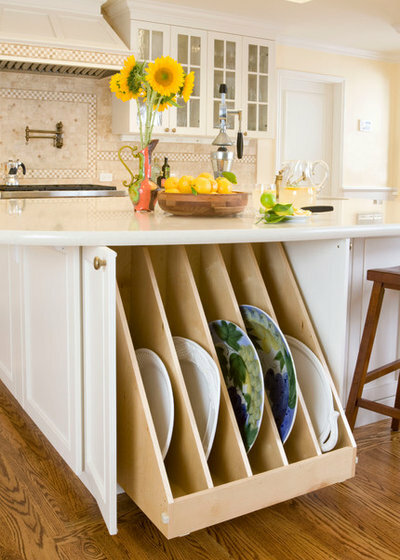 There you have it, if nothing else, these 5 simple storage concepts will make your kitchen more organized, cleaner and, best of all, more spacious. Choosing white isn't the only trend in kitchen design these days, store it, roll it out and look pretty cool doing it too! They're showing, please, not their showing (paragraph 2). 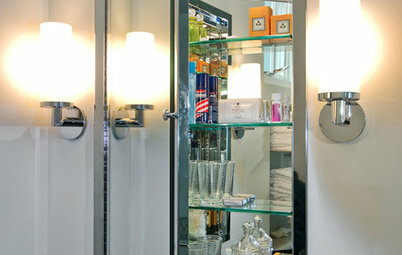 Bathroom Storage Medicine Cabinets: Should You Get a Recessed or Wall-Mounted Style?